Ozone is Used for potable, process and spring water treatment where disinfection by-products are to be minimised. Ozone is generated using corona discharge cells and dissolved into water using injectors or static mixers. Dioxide Pacific was engaged to provide three turnkey O3Pure ozone bottled water disinfection systems. Plant capacity: 3 m3/hr, 9 m3/hr and 30 m3/hr. Disinfection of bottled water with ozone requires attainment of CT credit so that disinfection is assured. Very accurate ozone residual control is required during bottling and stand-still. If ozone residual is too high entering PET or PC bottles, there is a risk of tainting from reaction with plastic components. If ozone residual is too low, disinfection is not assured. 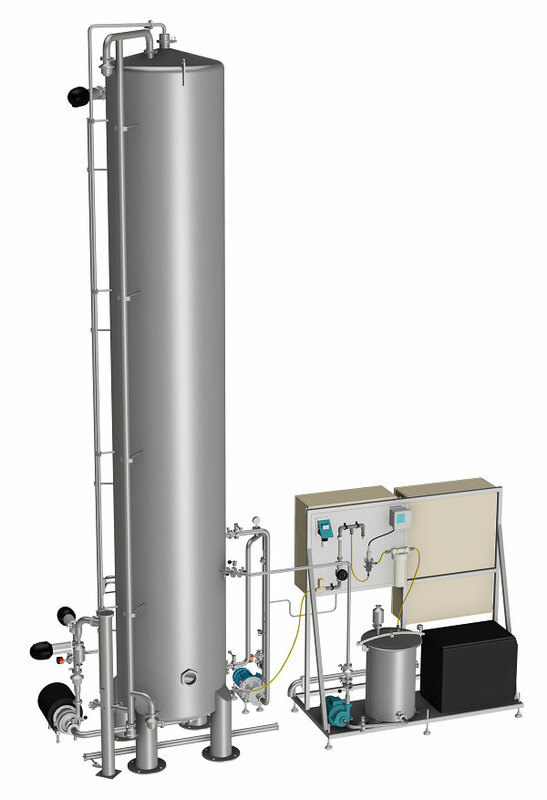 The Dioxide Pacific O3Pure ozone system combines the elements of a plug flow reactor with PID ozone residual control. The O3Pure plant is designed in 3D and manufactured as a sanitary system with high quality 316 s/s valves, components, tube and pumps. Product contact surfaces are 2B standard and welds polished to the required finish. The plant is operated from a local control incorporating PLC and touchscreen with ethernet communications and remote access. Ozone residual control is excellent and 0.3 +/- 0.05 ppm is achievable. All systems are being maintained with a preventative maintenance contract by Dioxide Pacific. Dioxide Pacific was engaged to provide a turnkey O3Pure ozone bottled water disinfection system. Plant capacity: 24 m3/hr. Spring water is transported from the source by tanker to the bottling plant where it is stored. It is pumped through 3 stage cartridge filtration into the O3Pure ozone disinfection system. Water enters the O3Pure reactor and reacts with ozone in a counter-current direction. Ozone is generated from oxygen using a PSA oxygen generator. The 90-95% pure oxygen stream enters the ozone generator at 3Bar and produces ozone at up to 120 g/m3. This high concentration ozone gas mix is dissolved into the water and mixed with the main water volume in the plug flow reactor. Ozonated water exits the reactor and is pumped using a pressure controlled system to the filler. Ozone residual control is excellent with tight, reliable control at all times. The central control panel includes an automated sanitisation sequence for high concentration ozone sanitisation of reactor, filler and pipework. The complete turnkey system including design, mechanical and electrical installation was done by Dioxide Pacific in 8 weeks. The system is designed to be fully sanitary and to conform to pharmaceutical standards. Initial plant design was done in 3D with production of GA layouts at quotation stage. All valves are sanitary diaphragm valves and stainless steel components including reactor, pipework and skid are 316L. Product contact surfaces are 0.8 Ra minimum and full validation documentation suitable for pharmaceutical standard was provided. Ozone residual monitoring is from a Rosemount ozone residual probe and control is from a Dioxide Pacific PID controller. Pumps are Fristam and control system PLC with touchscreen controller. The complete plant is mounted on a stainless steel skid with drip tray. The system was factory tested before shipment, packed and sent to site where it was reassembled, installed and commissioned.